The twelfth annual trip to New York will take place in December 2018 - dates coming soon! The trip is organized by the Departments of Economics and Finance and Marketing, with assistance from the student organizations NABE, ODE, and SFA. Economics and Finance students will visit major financial institutions to learn more about cutting-edge issues involving the global economy and financial system; past visits include Bank of America, JP Morgan, New York Federal Reserve Bank, and Moody's. Marketing and International Business students will visit major corporations to learn more about the various aspects of Marketing and International Business. Companies visited in past years include: Interbrand, Viacom, Bloomberg, SAKS 5th Avenue, NBC Universal and Spotify. Students will have the opportunity to meet a growing cadre of Cameron School alumni working in New York at a mixer to be held in Midtown. CSB Marketing, Finance, Economics and International Business students visited New York City over December 12-15, 2017 to visit local firms for job and internship prospecting, as well as mingle with CSB alumni at a mixer. This trip is offered each year to students in the Economics and Finance, Marketing and International Business concentrations. 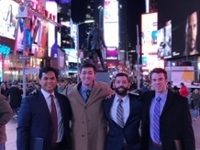 About the trip, senior Luke Barcley says, "New York gave me a great understanding of what it would take to work at the large, well known firm, like the places we toured. It helped me see that those positions are attainable even though I didn't go to a prestigious university. But more importantly it helped me see that there was not going to be a way to succeed at those type of jobs without a lot of hard work. That was the main point of a lot of of the talks and my conversations with alumni. So even if I don't end up in New York, I know the amount of hard work it will take to compete with those people who work in in New York City. Overall it was a great experience."